You are here: Home / Home / PlanAhead – a little goes a long way! PlanAhead – a little goes a long way! Last year, I tried to do everything online as far as keeping track of my family’s schedule and blog business goes. I synched my calendars with Google and switched important documents over to Google Docs. I even created a ridiculously detailed editorial calendar with the spreadsheet option. My intention was to be able to access all my stuff from anywhere… my iPad, my phone, my laptop, or any other computer I might be in contact with. In the end, it didn’t work out so well. I ended up neglecting my blog’s editorial calendar completely, forgetting to update it on a regular basis. Same with my family’s calendar. Post-Its on the fridge seemed to work just fine. What I thought was a genius idea last January, now seems really dumb. I mean, I basically use my laptop 95% of the time. At home. My iPad is for reading, playing games, and maybe returning an email or two, and my phone is for texting and making calls. Obviously. Why I thought I needed to access my calendar from every gadget I own – anywhere/anyplace – is beyond me! This is why I’ve decided to go back to a paper planner this year. It’s so much easier to have something readily available on the kitchen counter that I can reach for at a moment’s notice. PlanAhead sent me one of their See It Bigger Planners for review recently, and I believe I have found the perfect planner for me. It’s big. And I like that. There’s plenty of space for me to write things in. I’m going to be bad (very bad!) and combine my family and my blog’s calendars, so I’ll need the space that the monthly overviews and weeks at a glance provide. We’ll see how this pans out. We’re not super busy (yet) so I don’t see it being a problem. It’s all about using different color pens! This planner is very well made. The cover is a thick, durable plastic, the tabs are laminated, and the pages don’t tear out easily. 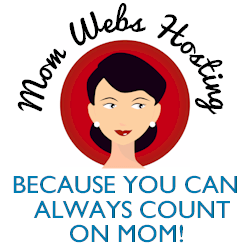 There are sections for personal information, contacts, events, notes, and even a password log. The type is big. Big enough that I can read the text at a glance, even when the calendar isn’t in my hands, but next to me on the couch (my office!). I could see this being a great planner for grandma, or an elderly neighbor that maybe has vision trouble. However, it doesn’t scream “special large print edition,” so it would be a nice, considerate gift that I’m sure anyone would appreciate, no matter their age. The only thing I’d add to this planner is maybe a pocket inside the cover to store receipts, coupons, or notes that I write elsewhere. I’m all about pockets! It’s nice to be able to flip through a paper planner and see all the blank pages, ready to be filled with ideas, dreams, and the many fabulous activities to come this year. I’ve already jotted down birthdays (thanks, Facebook! ), my daughter’s days off from school, and a few other upcoming events, but I’ll also be scheduling my workouts, writing in my weekly weigh-ins, and using it as a journal of sorts for recipe ideas and thinking up blog posts. Something that I couldn’t do so well with an online calendar. PlanAhead’s See It Bigger planner comes in blue, black, or a berry floral pattern. It’s available at retailers nationwide, including Wal-Mart, Target, Office Depot, and more, for about $9. Find a full list of locations here. If this planner seems too big, there’s also a pocket version of the See It Bigger style. For more information, please visit www.planaheadnow.com. If you’re making organization a priority this year, or you just need a new planner, then this giveaway is for you! Leave a comment below telling me how you keep your calendar organized for a chance to win a See It Bigger Planner from PlanAhead. Selection of color will be at sponsor’s sole discretion. A See it Bigger planner was provided to me at no cost, for review purposes. Giveaway entry period ends Tuesday, January 10th, 2012. US entries only, one person per household. Leave a separate comment per entry and a valid email address. Winner, chosen at random, has 3 days to claim their prize. I have post-its and notes everywhere. I am not very well organized. I could really use this calendar. I have a droid bionic and am going to try to keep track on my phone as well as a calendar at home. I would love to be more organized! In the past, I would use a big calendar to keep track of my kids’ sports activities. I’d write the time & place, using a different color for each child. Now, only my son plays sports, so it’s not as confusing. If I win this fabulous prize, I’ll use the Planner to keep track of giveaways I’ve entered. I keep my calendar organized by writing down dates as soon as I get them and keeping a check on everything weekly!! When you view your timeline or your list of tweets, it will show the message you posted with a timestamp that looks like “48 seconds ago,” “5 minutes ago,” etc. If you click the timestamp it will bring your tweet up in a window by itself. Then, you just copy the link in the address bar and paste it here! Being a disabled person, I need all the help I can get to get organized. My memory is affected by my diseases and if I don’t write things down, I am a real mess LOL. This looks like a great planner. Thanks for the opportunity to try to win it! I have 2 different calendars to juggle so I’d like to win this. I’m an email subscriber to The Domestic Buzz. I use highlighters on the calendar in different colors to categorize the different activities and events so i can easily see what it is quickly. I’m not at all organized, that’s my problem. I’m beginning to think I might have to go back to the old paper organizer, too. Uh, I don’t do a very good job. I use Outlook calendar, but that doesn’t help when I’m not at the computer! I could use this planner! I just us ethe monthly calendar to write down things that need to be done. I have a wall calender and have been using post-its and a small notebook to keep track of everything, it’s not working out so well. I plan to write neatly in it. I use a fine point pen! I make a point to have one errand day so I can get the rest of the days open for activites. i just write on my calendar. I keep my calendar with me, and if it’s something that affects others, I will post it to a family calendar online. I like to keep a calendar on my desk so I won’t forget anything important! I actually can’t keep anything organized. lol. I’m horrible at it. mistee dawn´s last blog post ..10 on Tuesday – Current TV Shows I Watch. I color code my entries; so at a glance I can tell what’s coming up. Volunteer work-pink, club meetings- blue, ect. How do I keep it organized? Shoving pieces of papers with notes in the calendar hoping will fill itself out. LOL. I dont always keep it organized but I try! I used weekly minders throughout the 90’s – both as calendars & mini-journals … i enjoy going back through them & seeing what happened on a daily basis … who i met, what i did, blah blah blah … that just isn’t the same electronically … Would love an opportunity to restart that habit … Thanks for the reminder !! I use the cozi calendar online. I love that I can set it to email me reminders. 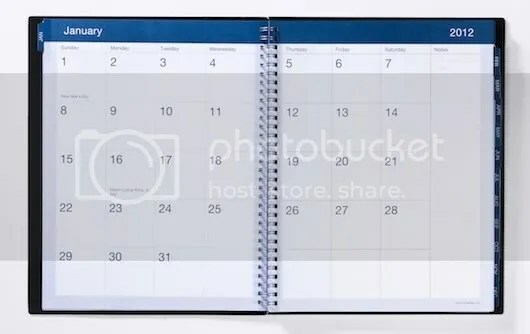 I use a printable calendar in my household binder also. I love the look of this one. I subscribe with my google reader. I am obsessively organized and use a planner. Just haven’t bought one yet for this year (my current one ends in January). The one you’re offering is my favorite style – simple and easy to use. I use post it flags, highliters and multicolored pens! I plan to mark things down on the calendar in the immediate instead of being left in the lurch because I put off doing it. I AM VERY DISORGANIZED, SO I AM JUST STARTING TO FORCE MY SELF TO WRITE THINGS DOWN.. It might sound crazy lol, but i keep my calendar organized with mini sticky notes! they work great, and keeping them coordinated by color makes things that much more easy. I keep my planner organized by using different colored ink for different types of tasks. Emily´s last blog post ..Winners! I write on my calendar and sometimes use post-it’s. Thanks. right now my calender is my iPhone cal. i put everything in there and use reminders to buzz me and remind me. wish i had a paper cal though! I keep it up to date. 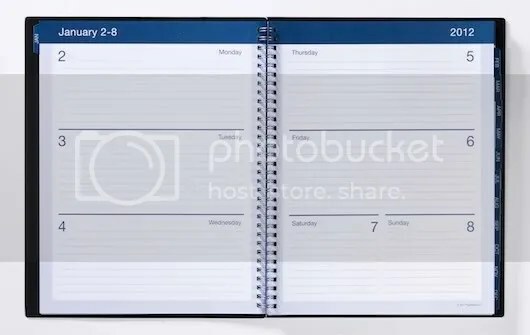 I love this planner but have been unable to find it anywhere. I live in South Florida, and would appreciate it if you could tell me where to get it. I’ve tried Walmart and Office Depot and Staples to no avail. Thanks! I’m trying to be organized by juggling 2 calendars, it is not easy like I thought it would be. Marj M.´s last blog post ..Running Circles Around Myself.